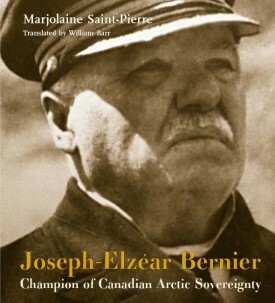 In Books Tagged In Arctic Exploration, Arctic History, Arctic Sovereignty, Artic, Biography, Books on Quebec, History, Joseph-Elzéar Bernier, and Northwest Passage. One hundred years ago, on July 1, 1909, Captain Joseph-Elzear Bernier, his officers and crew erected a plaque on Melville Island in the Northwest Passage and laid claim to the entire Arctic Archipelago for Canada. It was the crowning moment in the life of a man identified as one of the 100 Great Canadian Achievers in 1967. Born in the small busy seaport of L’Islet on the shores of the Lower St. Lawrence, Bernier was destined for a life on the sea to which he and his ancestors had been so intimately linked since the first Bernier touched land at Quebec in 1651. But it was through his own curiosity, drive, intelligence, and passion that he become a ship captain at 17 and later set many transatlantic records as ship helmsman. Above all, these traits enabled him to travel in the harsh arctic waters and ice and to learn how to winter there from the Inuit whom he encountered and befriended. A passionate, magnificently illustrated, and rigorously detailed biography of a hero who marked the history and geography of Canada. Marjolaine Saint-Pierre spent five years researching Bernier and has spent even more defending his contribution to Canadian sovereignty in the Arctic. “Marjolaine Saint-Pierre combines the skills of researcher, historian and storyteller to produce a wonderful book.” — Daniel Rolland, Culture Hebdo.com. Translation and foreword by William Barr, Senior Research Associate at the Arctic Institute of North America, University of Calgary. Published in collaboration with the Arctic Institute of North America.